We recently spent a couple of weeks in Bali, Indonesia and enjoyed many, many Nasi Goreng. When I travel one of the ways I can extend our holiday is by re-creating our favourite dishes. 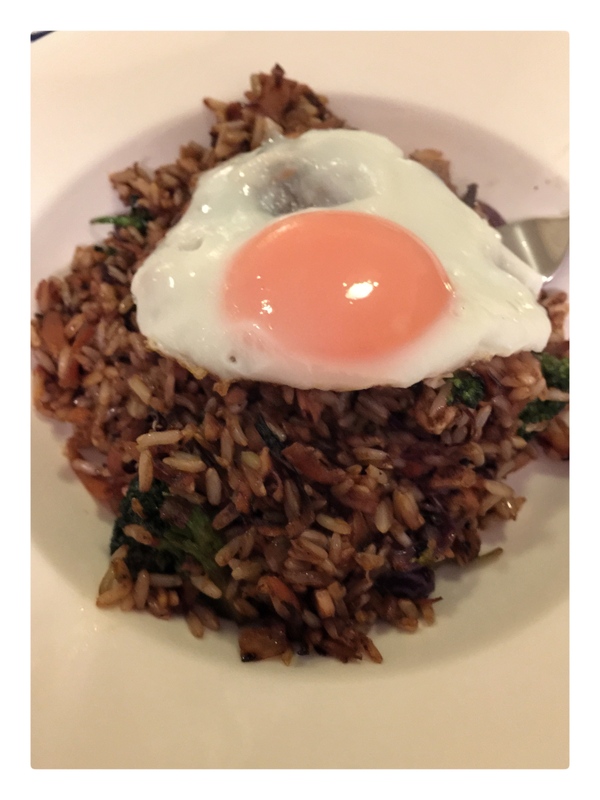 This is my take on Nasi Goreng. The recipe works equally as well for Mie Goreng – just swap the rice for noodles. You can use white rice, although I prefer brown long grain rice because it gives the dish a nice nuttiness and flavour. The great thing about this meal is that it is made with ingredients you can find in most kitchens – or they are easily found in your local supermarket. My wife took it for lunch the next day – and by all accounts it was just as delicious. Start with cooking your rice. Take 2 cups of brown rice, add to 1 ½ litres of boiling water and cook until tender, 20-30 minutes. Drain and cool. This can be done the day before or in the morning of the day you want to prepare your Nasi Goreng. A selection of finely sliced or vegetables cut into little florets, red and white cabbage, spring onion, broccoli, cauliflower, whatever you have available in your fridge to add. Method: In a wok or deep fry pan, add half the oil and heat until shimmering Toss in the garlic, chilli, coriander and cumin. Add the onion and carrot, stirfry until onion is clear and has softened Add the chicken and prawns, stirfry until cooked. Make a well in the centre of this mixture, add your beaten egg and mix it through your stirfry Make another well in this mixture and add the remaining oil, heat until hot then add your rice OR egg noodles. At this stage, add your vegetables and stir fry until nice and hot. The heat of the dish will cook out your vegies, especially if they are cut up nice and fine/small. Add your kecap manis and soy sauce give a good stir through. Toss in some roughly chopped fresh coriander In a flat base fry pan fry off your eggs to top the rice or noodles with. This recipe should serve 4. This looks absolutely amazing! I’m going to have to try to make this at home 🙂 great post!